I think this is another one best led with the GPS track. 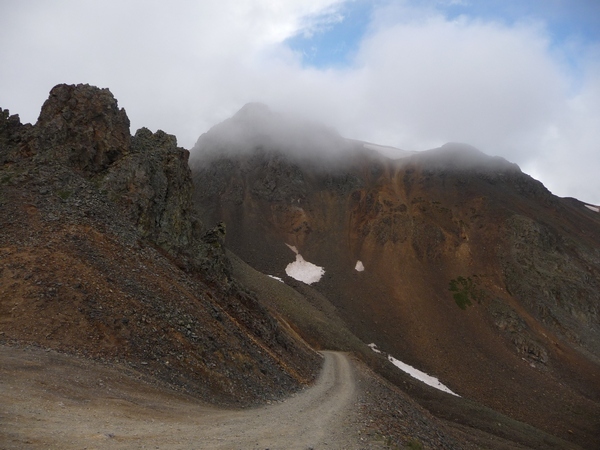 I traveled from the east (Animas Forks via Picayune and Placer Gulches) to the west (Corkscrew Pass). This GPS track is sort of in the middle of lots of things. 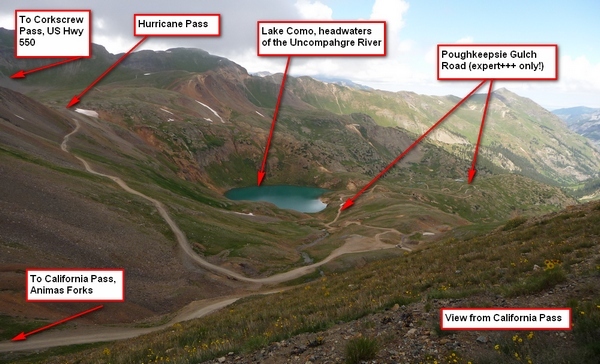 Separate posts cover Animas Forks and Corkscrew Pass. This shows what’s between. The parking area at California Pass is steeply slanted. I found a relatively level spot for the motorcycle. The last mile or so up the road from Animas Forks to California pass is not really as steep as it looks, but it’s well above tree line and does not countenance mistakes. Stay on the road. If you want to goggle the view, stop! Here's the sign at California Pass. It's rather up the hill from the parking area, so if want you're picture taken next to it, you'll have to walk up. Note the elevation! The view from California Pass is nothing short of spectacular! I’ve got a couple pictures here. One looks from California Pass down onto Como Lake and the other looks down the road toward Hurricane Pass. Yes, the mountaintop had snagged a cloud! View from California Pass looking northwest. You see Lake Como, headwaters of the Uncompahgre River. To get to Hurricane Pass, one must go all the way down there and then back up a bit. Here's the view looking west from California Pass. You can see that the road is in pretty good condition, but it's certainly not wide! Once you’re at the bottom near the lake, you’ll see the sign for Poughkeepsie Gulch. Beware! Poughkeepsie Gulch is for super-expert+++ riders. If you’ve rented a Jeep, your contract will prohibit you from traveling Poughkeepsie Gulch Road. Note the “Travel at Own Risk” on the sign. They mean it. The sign after you climb down from California Pass heading West. You want to make the left hand turn. Unless you have incredible experience and are with a group of similar capabilities, STAY AWAY from Poughkeepsie Gulch. It is passable only by those with specialist equipment. The road over to Hurricane Pass, traveling west, is not that bad. Once you cross over the pass, however, the road dips steeply down and, I’m afraid, there’s a fair amount of scree. Can't someone replace this sign for Hurricane Pass? It's been like that for awhile. After traveling down the scree and around the mountain, you’ll have a view as shown in the next photo. You can see the cutoff to the right that goes over Corkscrew Pass and down to US Hwy 550. Note this is a fairly good road but also quite steep, with 20% or more grades in places. I haven’t yet traveled Hurricane Pass the other way (from west to east). I’ll do that someday. GPX file that includes this trip: click here. This entry was posted in GPS Tracks, Motorcycling, Ouray County, San Juan County. Bookmark the permalink. I updated the post to include a link to the GPX file at the very end. I’m amazed I found it from seven years ago! Hello could I get a copy of your GPX file for this trip? I’d vole to follow in your tracks this summer. I have ridden the COBCDR and gone through Cork screw, haggerman Ophir. I like the route you ran on this trip , and I’d like to try it.